Review published in IJPE, Vol. 5, No. 3, April 2009, p. 218. This book presents the theory of reliability in very lucid and comprehensive manner. The very fact that the publisher had gone for the second edition proves its popularity with the readers, although before the second edition could be produced, the second author had died..
Two new chapters, viz., chapter 9 and 10 were added to the second edition. The development of chapters has been mainly based on the system structure and the nature of failures, namely, independent and dependent. The reviewer cannot understand why the tile of chapter 4 is "Systems of Independent Components" whereas the title of chapter 6 is "Dependent Failures". It would have been better if the authors had provided system reliability expressions with dependent failures, side by side for the systems discussed in chapter 4 after first discussing independent and dependent failures as a classification of failures. Similarly, the title of the chapter 10 is "Reliability of Maintained Systems" whereas what is discussed mostly is availability and not reliability as it is usually implied. 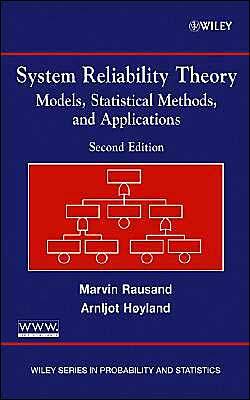 One can also compute reliability of maintained systems, if one wants (as was done by the reviewer in his book (not cited in this book), Reliability Analysis and Prediction (Elsevier) in 1992. Also it would have been better to explain the concept of statistical safety first (the definition of safety is given very briefly on page 7), and then discuss safety systems and finally the reliability of safety systems, although many of the methodologies for safety and reliability are common. Except for these minor comments related to the organization of the book, the reviewer is of the opinion that this is an excellent text among various books available today for understanding theory of reliability. The coverage is adequate for a student or a practicing engineer to become well-versed in know reliability theory and to understand the underlying assumptions for its applications to real systems. The book is informative and provides a good insight of methodologies and techniques used in reliability engineering. Review published in the International Journal of Performability Engineering, Vol. 5, No. 3, April 2009, p. 218.